The news of Julian's arrest came to me within minutes. But i had been expecting it. Julian's father had been in Canberra the previous weekend lobbying in the Parliament and he honoured me by coming to meet me in Bec's father's garden. The news was grim. But such despair arose at the news it left me numb, dull in both body and imagination. It was Bec who called me to action. She had heard the news on radio driving back from Batemans Bay. She by contrast is full of excitement and challenge. "I like Julian. I have always liked his looks. His peace hand gesture from the balcony of the Ecadorian Embassy. "Let's get the #FreeAssange mural on show at the Parliament tomorrow morning." So it was agreed. Action. All praise to the early waking grievers! 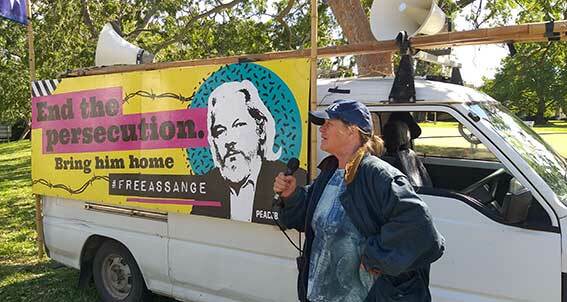 Peacebus and banners would be on parade at 7.30 am next morning Friday 12 April 2019 at the intersection of State Circle and Melbourne avenue, the entrance to the Parliament used by politicians and press. Folk from outside Canberra coming to the Parliament to protest tend to choose what's called the AAA (Authorised Assembly Area). It is at the top of the lawns between the Old and New Parliaments. It's a vast and architecturally dramatic space which both contains and overpowers protest. Talking truth to power tends not to happen there and folk go away feeling powerless. Canberra protesters of discern (like Bec) prefer this intersection. There ones see faces in the passing cars coming in from the airport and knows they see the signage. Plus the bonus of the passing traffic on State Circle. But this day was a Friday and the the pollies would have gone home. Furthermore an election had been called and now the Parliament in caretaker mode till after the count. May the ScoMo government be out for the count and never sit again. Hooray. But Bec decided we should do it anyway. Coincidentally it was Bec's birthday. Bec decides. Banners at the ready we arrived. The cops were quickly onto us. Got ID from us but did not obstruct the set up. ID checked they came back smiling and giving us every encouragement. It was like we were celebrities. As i was rigging flags and banging pickets, the AFP Protection Liaison cops pulled up beside. Hand shakes and warm greetings. "Anything we can do for you, give us a call, ok." Release Julian Assange my heart was whispering. "I want to go on to the British High Commission after." "Sure. I will call them and say to expect you." So it was that we sat about in witness for the injustice done to Julian. Lots of traffic and lots of honks in support. Maybe one in 100 cars, as much as we have had for #StopAdani actions. I was impressed by the number of lorry drivers who honked. An ACTion bus driver honked, waved and swerved a little, like a wing waggle salute of a fly by aircraft. But Bec and i had a spat about flags. 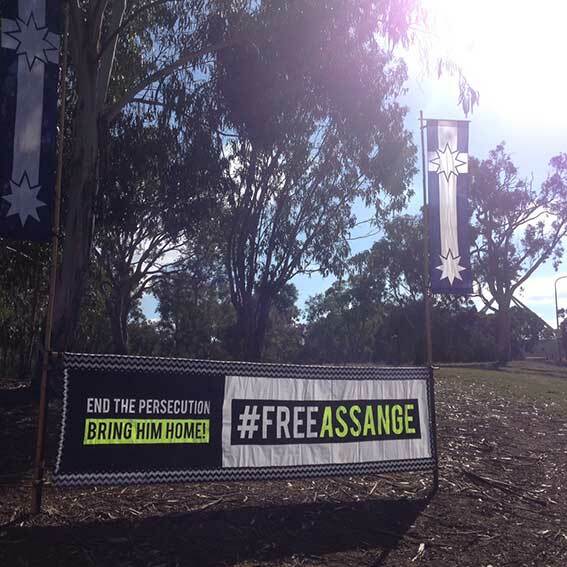 First i rigged four Black Cockatoo flags about the #StopAssange mural to add to its eye candy power. The flags were created for the #ClosePineGap campaign of 2016. To me they speak of bearing witness to state secrets. Bec's birthday. Crestfallen I withdrew the Cockies and put up Eureka banners instead. Bec was happier with that. "Fighting to defend rights and liberties" was appropriate. She was also happy to take to the mike of the Peacebus PA and speak robustly to British High Commissioner from across the road with passing traffic on Commonwealth Ave honking in support. But the best bit for Bec was the chance arrival at our action of a bicyclist who turned out to be a Geelong Grammar school friend not seen for 25 years. Our witness became a social event. Witness as a great way to do a birthday. I am still deeply disturbed by Julian's arrest. Been doing a lot social media reading. What Guy Rundle wrote about the media response in Crikey 13 April resonated with me in, "Julian Assange is in the dock but it is Investigative Journalism which is on trial." Dark times. The tyranny of Empire reveals cowards in public office and the gutless and the grovellers in the news rooms. So let me urge activism. However small the gesture. It's better than silence, better for the heart. Better for the spirit. Be visible. Speak up. Speak out. Organise, organise, organise. Here is Bec spruiking at the corner of Commonwealth Avenue and Coronation Avenue, across the road from the British High Commission.